A Different Kind of Bed & Breakfast. 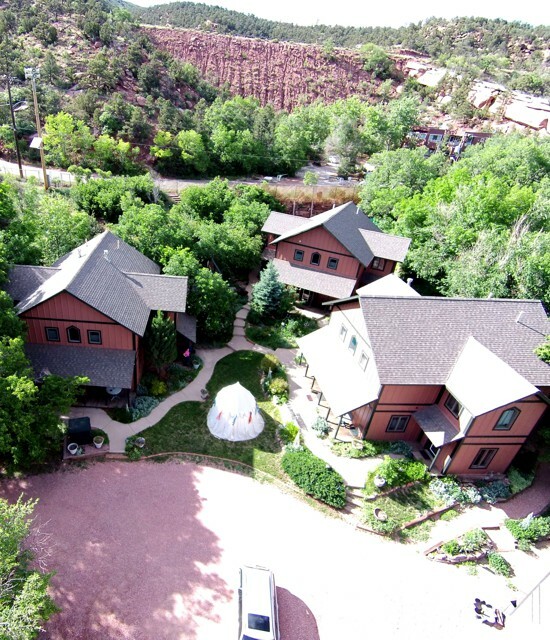 Blue Skies Inn is a family friendly charming bed and breakfast in Manitou Springs, a small mountain town nestled at the base of Pikes Peak in the Colorado Rocky Mountains. We are located just west of Colorado Springs and are near to Denver, Canon City and Pueblo. Our inn is located right in the middle of our many area attractions. 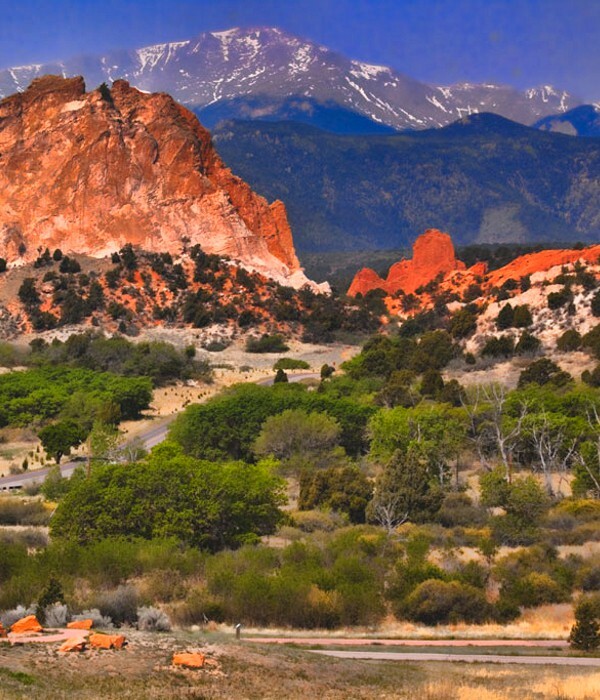 Within half a mile of us, you will find Garden of the Gods, Pikes Peak Cog Railway, Cave of the Winds and the Manitou Cliff Dwellings. White-water river rafting in Buena Vista, Canon City and the Royal Gorge is an hour's drive. Built by an artist, the inn is designed to be a fun, one-of-a-kind experience for the traveler. We planned the inn to be as memorable as your visit to our mountains, so we cook, bake, decorate and garden with our guests’ pleasure in mind. If you're looking for a way to get lots of value out of your travel dollars, consider the spacious suites at Blue Skies Inn where you can enjoy all of your meals during your stay. We will start your day with delivery of a full hot breakfast. Our 450 square-foot suites are designed for an in-suite breakfast, but why stop there? Every suite has a microwave and fridge, so if you wish to enjoy another meal here each day, you can stock up on lunch and dinner groceries and "fix your own" rather than depend on restaurants . Tell us what dishes you need, and you're set! 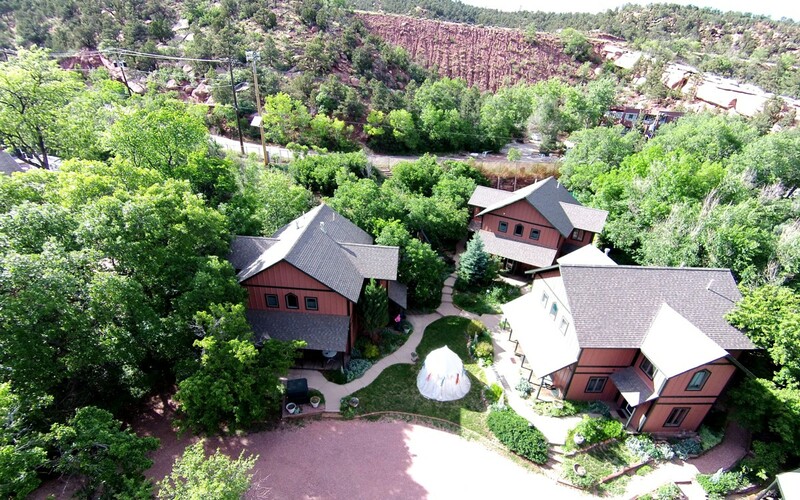 Built by an artist/craftsman, Blue Skies Inn bed and breakfast was designed to complement the elegant 1886 structure at Briarhurst, the historic estate of the founder of Manitou Springs. 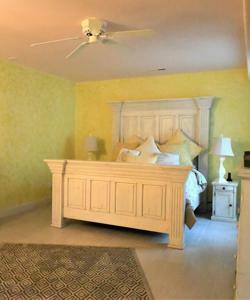 We have recently finished a full restoration of the 1873 Briarhurst carriage house here at Blue Skies Inn. We enjoy sharing stories about the colorful history of our Pikes Peak area and of the adventurous early pioneers who settled here. Our property is a constant source of relics from yesteryear. Feels as though you've discovered a remote sandstone canyon wall that ancient Indian tribes used. Stenciled with ferns in restful shades of green, it will remind you of an evening's stroll through deep woods. 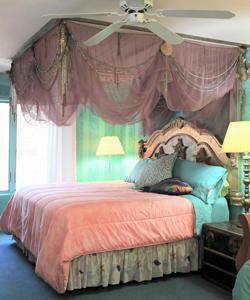 Hand painted suite with a whimsical sea motif throughout the sitting room, bedroom and bathroom. 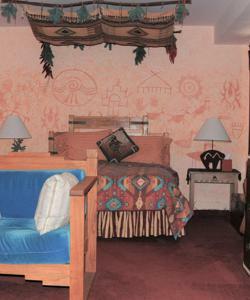 Warm colors and Indian images in our first rock art suite have been one of our customers' favorites. 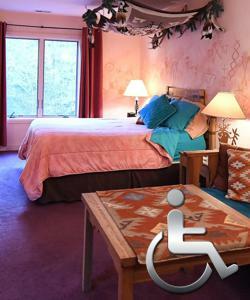 Since we're called Blue Skies, we also named a suite after our reason for being in Colorado. 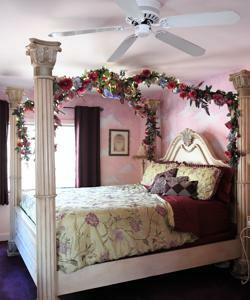 We made a suite in restful hues of green and lavender in honor of the gardener of the Briarhurst estate. 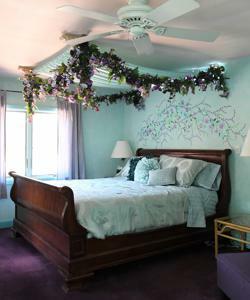 Flowering morning glory vines climb and curl whimsically over the walls of this pretty robin's - egg blue suite. 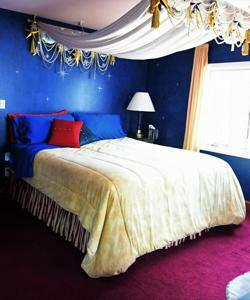 Glorious blue to portray the vision of the Universe, this suite has stars, galaxies and comets to amaze you. 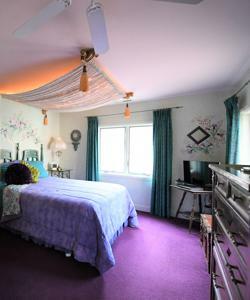 We painted our most romantic suite with evening sky, shading from pink to lavender and filled with clouds.